Package bees will arrive in Anchorage and Fairbanks on the afternoon of April 22nd. Sarah will be flying into Anchorage with Southcentral packages, Wigi will be flying into Fairbanks with interior packages. Distribution will begin as soon as possible, and dependent upon cargo handling times. 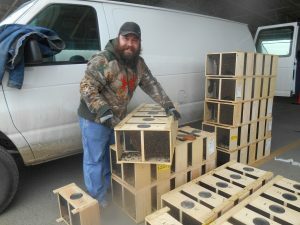 Sarah and Wigi will be updating the Sarah's Alaska Honey Facebook Page with regional delivery updates as we have them. The bees will be arriving between 3 PM and 5 PM. It takes some time for the bees to be unloaded from the plane, and then loaded into vans for distribution. The times listed below are our best guess of the times that bees will be available for pickup. Monday, 4/22, 4:30 PM to 6:30 PM. This is a hard end time, Sarah has to travel to Kenai after this, and beat an all night highway closure at Mile 88. Tuesday 4/23, 2 PM to 8 PM. Wigi should be back from Fairbanks to continue distribution for those unable to pickup on 4/22. Crystal will be gathering the bees for the valley and driving them out for distribution. Don't expect any pickups before 5:30 PM, April 22nd. Watch for updates on Facebook. She will have your contact info, and you will get a text or email with her phone number. Please be respectful of her timing needs to meet others, and feel free to toss some gas money her way as she is delivering all the way to Trapper Creek. Thank You Crystal! Tuesday 4/23, 9 AM to 12 Noon. Tuesday 4/23 10 AM to 1 PM in Soldotna - 33735 Gas Well Rd, Soldotna, AK 99669. Tuesday, 4/23, around 2;30 PM, Anchor Point - Anchor Point Greenhouse. Tuesday, 4/23, 3 PM to 5 PM, Homer - Captain's Coffee.